They came from large and small churches, United Methodist district and conferences from 28 states, gathering in Wichita for continuing education and a reminder that they aren’t alone. 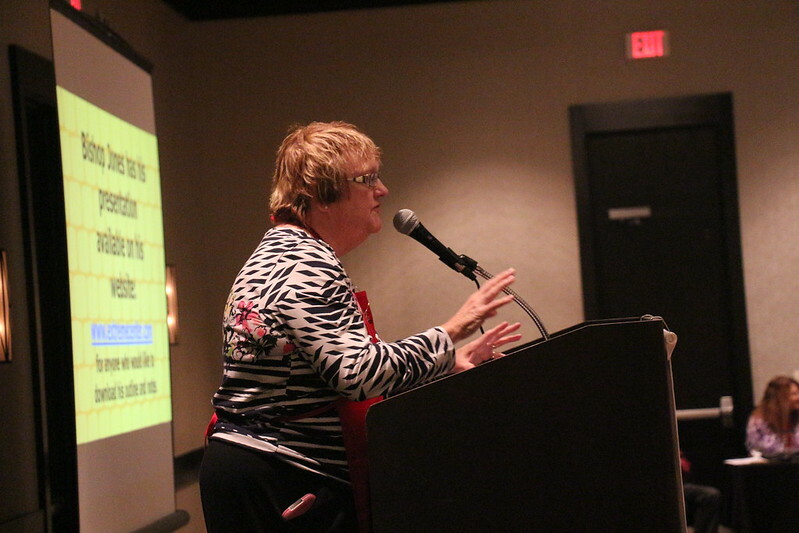 “This gives them a connection, a support,” said Tish Schultheiss, president of the Professional Association of United Methodist Church Secretaries, which met in Wichita from April 14-16. More than 160 women from across the country attended the convention, put on by the Great Plains Chapter of PAUMCS at the Marriott Hotel in Wichita. Next year’s convention is in Chicago, with the 2018 convention in Nashville, Tennessee. This year’s convention included a keynote speech from the Rev. Adam Hamilton, founding pastor of Church of the Resurrection in Leawood, Kansas, and his own secretary, Sue Thompson. Thompson has written a book about being a church secretary, and encouraged her colleagues to work as a team with their pastors. Great Plains Bishop Scott J. Jones also spoke to the group, including the transient nature of United Methodist staff members and a preview of the General Conference next month in Portland, Oregon. Other activities during the convention included a mission project for the Wichita-based EmberHope; a Friday lunch at the Prairie Rose Chuck Wagon, featuring cowboy music and comedy; and trips to Botanica, the gardens in Wichita; shopping at the Bradley Fair outdoor mall; and the Kansas Cosmosphere in nearby Hutchinson. Besides the convention, the 350-plus group members stay in touch through an online message board called Linking Hands, where discussions take place for everything from church ethics to the best copy machine for the money. “You can reach out and ask a question and within minutes people can chime in and say how they’ve dealt with that and offer different solutions,” Douglas-Boykin said.